Pamela Bowden (contralto); BBC Symphony Orchestra/Rudolf Schwarz. This is, I think, the second release by Lyrita of off-air recordings of BBC broadcasts made at home between 1952 and 1996 by the late Richard Itter. Apparently his domestic recording equipment was professional in standard and no one buying this disc need fear that the music is presented in scratchy, inferior sound. A previous release of British string concertos was warmly welcomed by Dominy Clements. This issue of vocal works by Bliss is also very important. The two opening items are among what Paul Conway terms in his excellent notes ’four exploratory essays in sonority and texture, written between 1918 and 1920’. Exploratory they may be but there’s nothing radical per se in the vocal line of Madame Noy. On the contrary, the vocal part is consistently melodious and attractive and one is reminded that Bliss wrote over fifty songs during his lifetime (review). Jennifer Vyvyan gives an excellent performance. The innovation lies in the range of instrumental colours that Bliss extracts from the ensemble of flute, clarinet, bassoon, harp, viola and double bass. The textures in the third of the piece’s four stanzas are especially intriguing. I enjoyed both work and performance very much. Rout is more experimental. The title refers to the use of the word ‘rout’ in connection with popular revelry. Bliss seeks to depict the musical sounds of a carnival as they might be heard by someone listening from an upstairs window. Here the vocal part is experimental in that Bliss gives his singer a text consisting of made-up words and syllables; in other words, like distant singing the words are to be deliberately unintelligible. The accompaniment, too, is experimental; the ensemble consists of strings (presumably solo), flute, clarinet, harp, glockenspiel and side drum. Subsequently Bliss re-scored the work for full orchestra at the request of Diaghilev and the composer recorded that version for Lyrita (review). Given now the opportunity to compare both versions I unhesitatingly opt for the original scoring which has a piquancy and immediacy which is rather lost in the fuller version. Once again Jennifer Vyvyan excels. The Enchantress is a much later work, written for Kathleen Ferrier. To the best of my knowledge there’s only been one other recording, a 1989 account by Linda Finnie which was conducted by Vernon Handley (CHAN 8818). In the notes accompanying that recording Andrew Burn observes justly that it ‘belongs to the tradition of dramatic concert works for solo voice and orchestra including Berg’s aria Der Wein, Barber’s Knoxville: Summer of 1915 and Britten’s dramatic cantata Phædra.’ I agree but I see that in reviewing the Finnie recording the late Michael Kennedy expressed the view that it ‘seems rather a contrived piece …. One can admire it without being drawn or deeply involved.’ I find it hard to dissent from that judgement though this intense and vivid reading by Pamela Bowden does much to prompt a re-think. She’s well worth hearing in the piece and she gets fine support from Schwarz and the BBC Symphony Orchestra. We still lack a modern recording of The Beatitudes but now we have a second live performance under the baton of the composer. This new release, which preserves the work’s first performance at the 1964 Proms, joins in the catalogue the recording of the very first performance of the work, given in Coventry in May 1962. That 1962 performance was issued by Dutton in 2013 (review). I’d heard so many bad things about the first performance of The Beatitudes that I was pleasantly surprised when I heard the Dutton disc. However, this 1964 performance, though it has one or two drawbacks, is much to be preferred. For one thing Bliss had the mighty if wheezy Royal Albert Hall organ at his disposal. Even this instrument wasn’t the swish new Harrison and Harrison organ in Coventry Cathedral for which he’d specifically written but it makes its presence felt in a way that the all-but inaudible electronic organ foisted on Bliss in 1962 simply failed to do. The other big advance on the 1962 premiere is the presence of a large and well-prepared choir. The Coventry Festival Chorus tried valiantly for Bliss but they’d simply had too much on their plate what with trying to learn both The Beatitudes and War Requiem at the same time and they were, after all, not a permanent choir but one that had been assembled for the occasion. The combined choirs that sang in this Prom performance make a much better showing. However, it must be said that the choral sound is rather diffuse at times – especially in the loud passages - and the words unclear. I’m sure that’s not the fault of the singers but rather the outcome of using a very large choir in the resonant acoustic of the “unreformed” Royal Albert Hall. In both performances Bliss was blessed with excellent soloists and I find it well-nigh impossible to state a preference between Jennifer Vyvyan and Richard Lewis (1962) and Heather Harper and Gerald English (1964). Perhaps Harper’s rich tones fall even more gratefully upon the ear than does the voice of Jennifer Vyvyan and some may prefer the bigger voice of Richard Lewis to English’s more narrow timbre but both solo teams give pleasure. Sir Arthur conducted well in 1962 despite the adverse circumstances; here, no doubt free of distractions, he conducts very well. He obtains a full-blooded, exciting performance yet the more reflective passages in the score are equally successful in his hands. The BBC sound on this 1964 performance is more satisfactory than the sound that the corporation achieved – in testing conditions – in 1962. 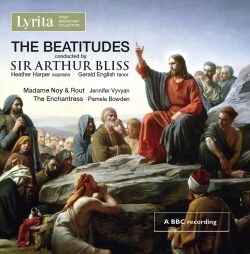 That and the better choral contribution makes this Lyrita issue the preferred version of The Beatitudes. Having said that, the Dutton issue of the 1962 first performance is by no means to be despised and it is an important document. The sound on these Richard Itter recordings is very good, especially considering their age and that they derive from broadcasts. The recordings of Madame Noy and Rout are rather close but in many ways that suits the music. Intending purchasers need have no qualms on sonic grounds. Mike Clements has been responsible for the tape transfers and restoration work; clearly he has done a fine job. Paul Conway’s notes are excellent and all the texts are provided, with the exception of Rout – for which they’d be of no real use, anyway. I’m sure that the release of these recordings is the result of long and patient negotiations over copyright and royalties. The persistence of the negotiators has been well worth it on the evidence of this and the previous release and the prospect of further CD releases from the collection of over 1500 Richard Itter recordings is a mouth-watering one. This new series could become as important in its own way as were the original Lyrita releases of neglected British music.